We devote this post to Weirdiana, a genre of rare book collecting that falls under the general category of Dangerfieldiana, books that don't get any respect, I'm tellin' ya, no respect at all. ("For her birthday, I gave my wife a 300 year-old book with foxing, damp-stains, toning, sprung signatures, shaved margins, and spine issues in a beat-up and dried-out goatskin binding. She looked at it, looked at me, and said, 'Twins!'"). Despite being off the wall they show nicely on shelves. We've harvested a grab bag of goodies from the vaults of Ann Arbor, Michigan's almost, not quite, maybe favorite son, Garrett Scott, Bookseller, who has an eye cocked for material of this ilk. Corrective lenses have been of no help whatsoever. Scorn the notched ear lobe. What a botched queer globe!" Now, take off your thinking cap, bless the notched ear lobe, sit down, and enjoy this botched queer globe of books. Then meditate on what the hell a "botched queer globe" is. BAIR, L.S. Naturopsychoism: The Hope of the World by... The Study and Practice of Naturopsychoism Leads to Perpetual Health and Eternal Happiness. This book is published for the purpose of helping build men and women physically, mentally, and spiritually. Kokomo, Indiana: L.L. Bair, [c.1918]. 16mo, original printed blue wrappers, 20 pages). "I fearlessly and courageously make the broad and comprehensive claim, that if the alimentary canal and the mind were kept in a state of normal purity, and if there were no poisonous drugs, violent scrums, deadly antitoxins or vaccine virus ever forced into our blood, there could be no disease in any part of the body." Bair, Kokomo's naturopsycho, prescribes a whole grain diet, spine alignment, and frequent evacuation of the bowels. Bair counsels that children "should also form the habit of trying four or five times a day for a bowel movement and ALWAYS before retiring," with an olive oil enema to follow if they do not (extra-green pure virgin presumably tops for tots). Includes a recipe for Bair's Naturolin Syrup (Epsom salts and sugar) and a few hints on preparing whole wheat coffee, retaining potato skins, ad cardboardum. 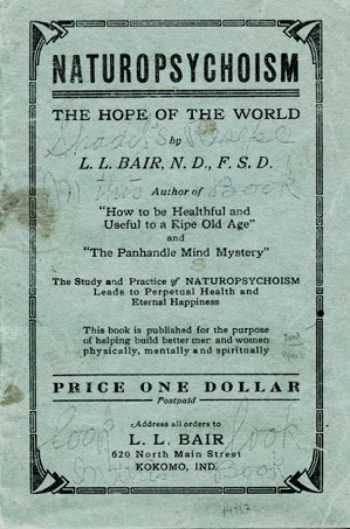 Rare bookseller Lorne Bair, of Winchester, Virginia (a mere 562 miles east-southeast from Kokomo, Indiana), disavows any familial relationship to Naturopsychoism author L.L. Bair, and denies all knowledge of the precepts of Naturopsychoism. Yet his interest and commerce in the literature of Politicopsychoism makes him an individual ripe for suspicion. Psychoism, no matter its prefix, is the "ism" of the perturbed. Anonymous. Enfermedades de las Mujeres. (Barcelona: Casa Editorial Maucci, [ca. 1910]. 12mo, original color pictorial wrappers, 126,  pages. Illustrations). 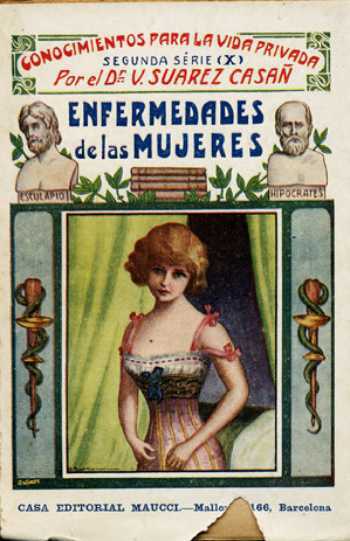 Published in the series "Conocimientos para la Vida Privada," this newsstand pulp on home gynecology includes a few recipes for home remedies and diagrams of pessaries. It does not appear to include Casanova's DIY use of a scooped-out lemon-half as contraceptive cervical cap, a bitter omission. Bad news for those who eat air. 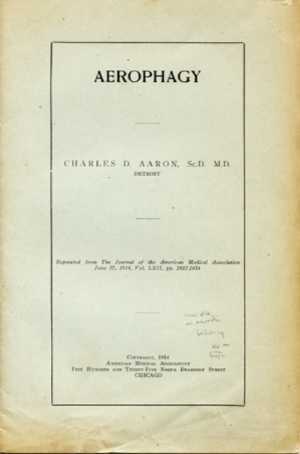 AARON, Charles D. Aerophagy. (Chicago: American Medical Association, 1914. 16mo, original printed blue wrappers, 20 pages). "Neurotic persons are known to have a habit of eating or swallowing air (aerophagy)." Then they digest castles made of sand and pipedreams, lose a lot of weight, become a wisp of oxygen, and excrete a gentle zephyr. Aerophagists are advised - I kid you not - to stick a cork in their mouth to facilitate belching of pre-digested nitrogen, oxygen, argon, carbon dioxide, neon, helium, methane, krypton, hydrogen and xenon gas - the breath of life. Now that you know what's in it, don't choke. My gag reflex is shot. WILSON, Amos. The Sweets of Solitude! or, Directions to Mankind how they may be Happy in a "Miserable World!" and Insure a Glorious Inheritance in That Which is to Come. By Amos Wilson, who Lived 19 Years in a Cave, Secluded from the Society of Man. Annexed is a Sketch. (Boston: Printed for John Wilkey, 1822. Octavo, remnants of one-third of the printed front wrapper neatly silked onto later blue sugar paper wrappers, 26 pages. 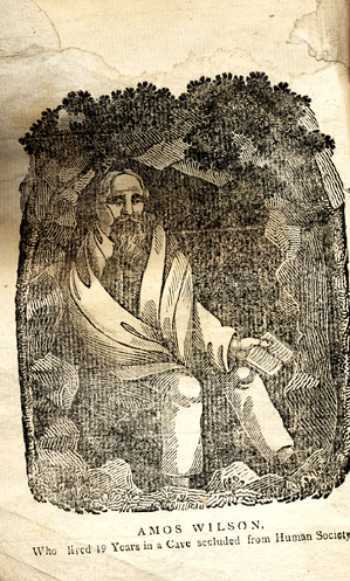 Woodcut frontispiece portrait of Wilson). An account of the celebrated Pennsylvania Hermit, who went into seclusion after his unmarried sister ("Deceived and shamefully seduced by a wretch") was convicted of the murder of her twin infants and sentenced to death. Wilson managed to secure her pardon from the Pennsylvania governor but was delayed in his return by a flooded river and so, alas, "arrived at the place of execution just in time to see the last struggles of his unfortunate sister!" Brain fever and two decades in a cave were the sequelae. 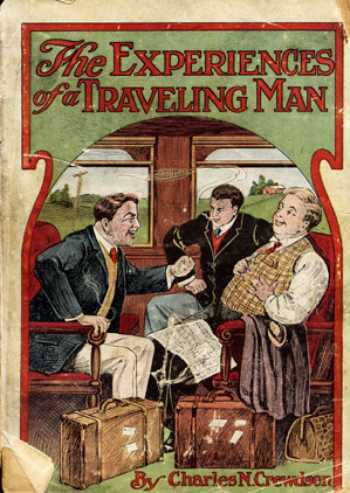 A traveling salesman's tricks, no joke. CREWDSON, Charles N. The Experiences of a Traveling Man. (Chicago: Thompson & Thomas, 1909. Octavo, original color pictorial wrappers, 352 pages). First-hand stories of life on the road for a salesman, with small tips and tricks of the sales trade as well as colorful anecdotes, i.e. the time the drummer (the guy who drums up business) closed a sale by playing Irish airs on a slide trombone. This success a documented fact, I predict that dealers playing Irish airs on a slide trombone will be the next big thing at the next big book fair, Yiddish, British, German, and French airs on a sousaphone a close second. That'll be me wearing a clown suit in a corner booth playing Flight of the Bumblebee on a tuba until I pass-out. In the rare book trade, low-key merchandising is the watchword; the books speak for themselves and multi-cultural airs played on brass and reed instruments will set the proper tone of cosmopolitan sophistication. They'll scream erudition and fine taste in a cacophony of High Kultcha. The farmer's daughter is, alas, nowhere to be found; she, evidently, was cloistered when word got around that a traveling salesman was in the area. And a joke's right to life was thus extinguished before it had a chance to breathe its set-up, much less punchline. Had it not been killed, it would have killed, surely, though Shirley was innocent. Scratch a person, reveal a printer. HALL, William E. We Are All Type-Setters. 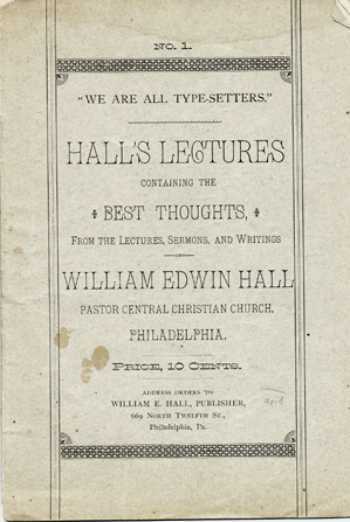 Hall's Lectures Containing the Best Thoughts From the Lectures, Sermons, and Writings of William E. Hall. (Philadelphia: William E. Hall, [c. 1886]. Small octavo, original printed wrappers, 7 pages). An extended metaphor on serving in God's print shop: "All proof must be corrected before the final 'lock-up' when the columns of our characters are emptied from the 'sticks' of habit into the galleys of our daily lives, and when these are transferred into the 'chases' of life's possibilities it is too late to correct the proof. Death with ponderous mallet drives the 'quoins' until the pulse stops beating and the eyes of the worn-out compositor are touched with the death-glaze. All revisions of proof are forever closed." My oil-based black-ink blood bleeds to the edge of the sheet, then stops and coagulates on the colophon where the Big Gripper holds me as I pass through the press of eternity to become a ghost-image. My epitaph: "Kiss die cut." This sermon originally appeared in the English typographic trade journal Hailing's Circular (Spring, 1886) with the sub-head, "A sermon delivered to Philadelphia Printers, on Sunday Evening, January 31st, 1886, in the Central Christian Church." Think your way to riches. Anonymous. 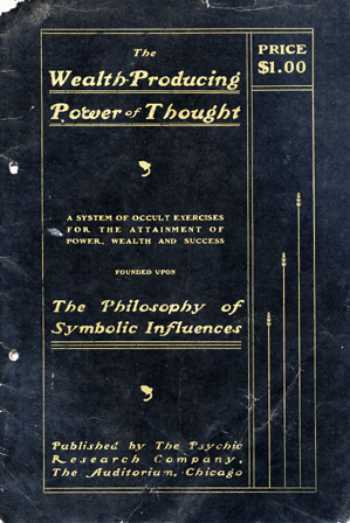 The Wealth-Producing Power of Thought: A System of Occult Exercises for the Attainment of Power, Wealth and Success, founded upon the Philosophy of Symbolic Influences (Chicago: Published by the Psychic Research Company, The Auditorium, ). Octavo, original glazed black wrappers, gilt lettering, 15 pages). Not exactly Nichiren Shoshu buddhism but as close to endlessly chanting "Nam-Myoho-Renge-Kyo" until it rained simoleons as you could get in the U.S. in 1901. The 29" singing star of the age. DUTTON, David. History of “The Little Fairy,” Miss Dollie Dutton. Also Containing the Songs She Sings. (Buffalo, N.Y.: Published by David Dutton, Buffalo Commercial Advertiser Steam Press, [1860? 1861?]. 16mo, original printed glazed orange pictorial wrappers, 16 pages. Illustrated). 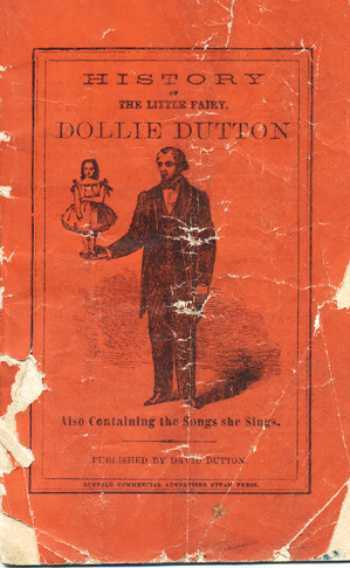 This promotional pamphlet for the once celebrated performing midget child from Framingham, Massachusetts, nine-year-old Dollie Dutton (who in 1860 stood 29 inches high), provides favorable press notices, verses composed in her honor, examples of songs she performed, and brief anecdotes of her life, written by the man who sired her, the rare example of a stage-father prior to Joseph Jackson screwing up his five+ kids. The Squirting Ring was a laff-riot in 1874. Anonymous. 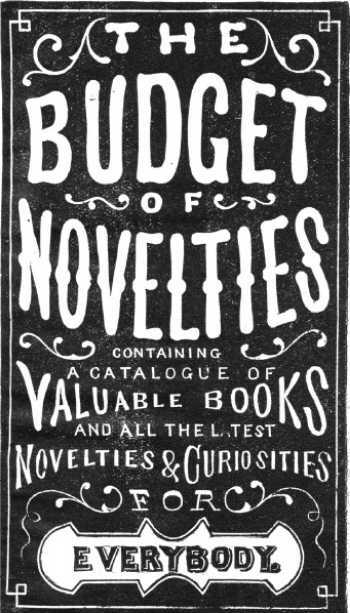 The Budget of Novelties, Containing a Catalogue of Valuable Books and all the Latest Novelties and Curiosities for Everybody. (Ashland, Mass. : Union Purchasing Agency, 1874. 16mo, original decorated yellow wrappers, 48 pages. Extensively illustrated). This detailed catalog of cheap novelties conclusively demonstrates that the passion for squirting rings, novelty serpent eggs (a kind of firework), special whistles for ventriloquists, card trick and magic books, novelty tobacco boxes designed and built with a hidden needle to prick the fingers of the unwary (a “capital thing to have where sports are always beating tobacco”) and, of course, the secret of clairvoyance was not confined to pre-pubescent boys living on 80th Street in Queens, NYC during the 1950s. After all, it was the teen emperor, Elegabulus the Wacky, who invented the whoopee cushion in the third century C.E. (thus stimulating my life-long interest in ancient Roman history), the modern version (for those who, as I, must know) re-invented by JEM Rubber Company of Toronto, Canada in 1930. 'Tis a botched queer globe of books, indeed. Weird lit. is a close cousin to, and reinforces, The Case For Nutcase Literature. Images courtesy of Garrett Scott, Bookseller, with our thanks. Mr. Scott's inventory is not exclusively weird. "Interesting Books by Unusual Authors" is broad and fertile (and affordable) ground.